PSD is basically a file format of Adobe Photoshop. 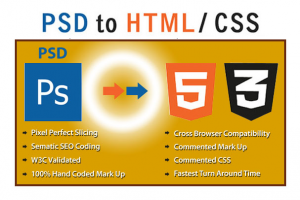 PSD to HTML conversion is an important service, which became increasingly popular in the recent years. With the Web 2.0-boom and the ever-growing popularity of blogs, there is a need for professional programming services in height. Omkarsoft offer services to make fulfill all kinds of PSD to HTML conversion requirements. It is most important to have your website coded properly according to web standard with the most recent technology. Being a leading PSD to HTML service provider, we convert your Photoshop designs into a 100% hand-coded, pixel-perfect, W3C validated & cross-browser compatible HTML/XHTML/CSS markup using CSS2.1 or CSS3. We at Omkarsoft trying to make the code most effective in Search Engines and give a fabulous impact on visitor experience. We code each page by hand and attention is given to the details down to every last pixel for unmatched quality. We take your design in PSD or any other layered format such as PSD, PNG, AI or INDD, slice it, optimise images, hand code into valid xHTML and CSS, and then we send it all back to you in 1-3 working days! If you are looking for quality and affordable PSD to HTML services from a team of experts, we are the company you might want to work with. Why Customers Choose Omkarsoft for PSD to HTML Conversion?